The County Clare Irish Hotel, Milwaukee’s premiere address for Irish hospitality, offers a home away from home for the business traveler or a cozy getaway for weekenders. The New York Times, the San Francisco Chronicle and the Washington Post highly recommend the County Clare’s exclusive accommodations. Walk into our fine establishment, and you will be welcomed by our favorite Gaelic sayings all around you, including Céad Míle Fáilte, which means “a hundred thousand welcomes.” Our Irish Hotel and Public House boasts a location just east of downtown and a stones-throw to Lake Michigan. We are also within walking distance to Brady Street, a fun local area with shopping, bars, and eateries, and Henry Maier Festival Park which hosts many festivals throughout the summer celebrating our diverse heritage in this city, including Irish Fest. Use our location as accommodations for your travels whether it be on business or pleasure. Our Standard and Snug rooms contain a comfortable pillow-top queen bed, hand-crafted comforters, and a luxurious double whirlpool bath. Of our 29 rooms, we have four exclusive suites with a couch sitting area, king size beds, and a larger bathroom. Our guestrooms features an open floor plan with interior design influenced by our roots of a traditional Irish Inn and Pub. Please note: All prices are subject to change based on events and holidays. The King Suite guestrooms feature an open floor plan with interior design influenced by historical Irish Inns. All Suite rooms contain a desk work area, sitting area with a pullout couch and coffee table, a comfortable pillow top king bed, handcrafted comforters, a luxurious double whirlpool bath, separate shower and wireless high-speed internet service. Each room displays original artwork from Ireland. Complimentary breakfast and free parking is offered to all overnight guests. Our Standard guestrooms feature a desk and sitting area, a comfortable pillow top queen bed, handcrafted comforters, a luxurious double whirlpool bath, separate shower and wireless high-speed internet service. Each room displays original artwork from Ireland. Complimentary breakfast and free parking is offered to all overnight guests. There are 2 Snug Rooms at County Clare. They are situated next to the elevator and are a bit smaller than our Standard Room. Our Snug Room features a comfortable pillow top queen bed, handcrafted comforters, a luxurious double whirlpool bath, separate shower and wireless high-speed internet service. Each room displays original artwork from Ireland. Complimentary breakfast and free parking is offered to all overnight guests. County Clare offers special deals and packages. Call now (414) 272-5273 to take advantage of these exclusive offers. Isn’t it time for a little getaway from it all with that someone special? Some restrictions apply. It’s only a day away! Stay at Milwaukee’s premiere place for Irish hospitality – The County Clare Irish Inn and Pub. Your stay includes, two drinks, hot breakfast, and free parking. Our lovely standard room features a queen-size bed and a double whirlpool bath. Valid Sundays – Thursdays. Excludes Friday, Saturday and special events. Mention this offer at the time of reservation. Subject to availability and some restrictions apply. Excludes tax and gratuity. Call (414) 272-5273 for this exclusive offer. Planning to visit your son or daughter at school? Delivering a care package, or just visiting your kid? Why not treat yourself to a stay at the County Clare? 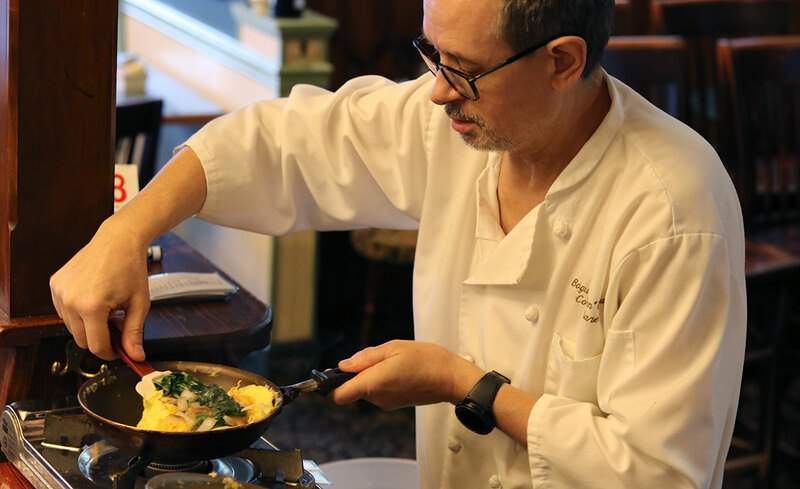 Milwaukee’s premiere place for Irish hospitality – The County Clare Irish Inn and Pub. Your stay includes hot breakfast for two and free parking. Our lovely standard room features a queen size bed and double whirlpool bath. Upgrades available. Mention this offer at the time of reservation. Valid September through May, Sunday through Thursday. Subject to availability and some restrictions apply. Excludes tax and gratuity. Child’s student ID must be presented at check in. Check in is at 3 pm. Check out is at 11 am. Due to the size of our inn, we cannot accommodate early arrivals. NOTE: We CANNOT accommodate arrival times after 12 am on Sunday & Monday nights; after 1 am Tuesday, Wednesday & Thursday nights; after 2 am Friday & Saturday nights. In the event you must cancel your reservation, we require 48 hours notice prior to your arrival. If less than 48 hours notice is given, you are responsible for the total cost of all nights reserved. Please check your arrival and departure dates. We are unable to give refunds for early departures. Enjoy our complimentary continental breakfast offered weekdays: 7 am – 9 am. Saturday & Sunday Brunch offered: 9 am – Noon. We value all our guests with disabilities and service dogs are welcomed. A service animal is a dog trained to do work or perform tasks for a person with a disability. No other animals other than registered service dogs are allowed on premise. Hotel guests receive a complimentary continental breakfast, and eggs made to order, offered weekdays: 7 am – 9 am. Saturday & Sunday Brunch offered: 9 am – Noon. 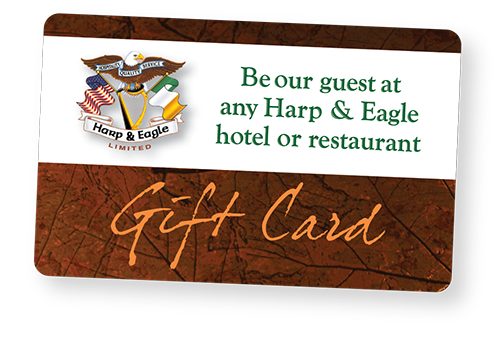 Use at any Harp & Eagle hotel or restaurant.